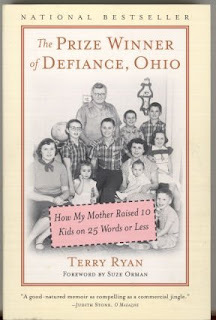 The full title of this book is The Prize Winner of Defiance, Ohio. How My Mother Raised 10 Kids on 25 Words or Less by Terry Ryan. That pretty much sets the premise of the book, which is based on the true story of Evelyn Ryan who raised a hungry brood on contest winnings in the 1950s and ‘60s. Her husband was an alcoholic who contributed very little to the family. In fact, his inability to provide for his family, coupled with his abusive temper was a hindrance that Evelyn had to work around. Undaunted, Evelyn armed herself with humor and an indomitable spirit and plowed forward to support her family the best she could. She did that by writing snappy little jingles for products like Dial soap, Lipton Soup, Heinz ketchup, and more. And she was good at it. She would set up her ironing board, get out her note cards, and write lines like: “Dial is wonderful, gently repealing what most fresheners just succeed in concealing.” She won many, many prizes: money, food, toys, and appliances just to name a few. It was because of her winnings that her kids were able to enjoy roller skates, pogo sticks, sleds, and boots. One of the most memorable scenes in the book is when she won a shopping spree at a local supermarket. Weeks before the scheduled ten-minute spree she strategized on ways to make the most of the “assault.” She shot through the store “like a missile” and hauled in $411.44 worth of goodies (about $3,000 today)! This book is a true love letter to a mother who gave all she had to keeping her family fed and happy! My mom didn't have to win prizes in order to feed us, but like Evelyn Ryan’s kids, we too, hit the lottery in moms. My sister always had a lot of faith in my mom. She would volunteer her for all kinds of things. When her Brownie Troop leader asked if anyone’s mom would be willing to provide juice and cupcakes for the next meeting, my sister’s hands shot up in the air without hesitation. “My mom can do it,” she proudly said. She knew she could and would do anything—even providing food and drinks to a troop of twenty girls, even if my mom didn't have driver’s license or transportation. Of course my sister was right. My mom might have rolled her eyes at being volunteered, but she was a trouper. She loaded my sister on the back of the bike rack and handed her a tray of carefully decorated cupcakes to hold onto. Then she slung a gallon of red Kool-Aid on each handlebar of the bike and off they went. Now, my mom wasn't about to take my sister on a busy four-lane street with no shoulders while balancing her daughter, cupcakes, and drinks. So, she wisely took the back streets through the neighborhoods. The problem was that one neighborhood was separated by the other with a big dirt drainage ditch. When my mom came to the ditch, I don’t know exactly what she was thinking. Was she irritated that she had to unload everything and carry it little by little through this impediment? Was she running late? Or was she feeling particularly daring that day? From her actions, I assume the latter. Like Evel Knievel jumping the fountains at Caesar’s Palace, she must have assessed the distance, the direction of the wind, the weight of the bike, daughter, goodies, and herself, and thought, “Oh, yeah. I've got this.” She backed the bike up a few yards. I can imagine her warming up with a couple of shoulder shrugs and roll of her neck, then one final deep breath AND --- pedal, pedal, pedal!! Legs pumping, heart racing, and suddenly she was airborne! She probably felt the wind flying through her hair and the flapping of her imaginary cape, just like Evel Knievel. She could see the other side. Victory was inches away. Then, boom! Just like Evel she fell short and crashed. 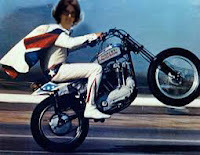 Unlike Evel, my mom and sister were the lucky ones. No broken bones, no video cameras capturing her humiliating failure. No one to see the cupcakes flying in the air, the red juice splashing in the dry dirt, a little Brownie cap soaring like a Frisbee, my sister scraped and crying, and my dazed mother wondering “What just happened?” It was an epic failure and an epic family story to tell over and over, that’s what happened. Well, maybe not quite like that. I may have exaggerated a tiny bit. This story is one we love to tell over and over when we need a good chuckle. And like a good legend, the tale just may have grown a bit bigger. The truth is my mom never got airborne. In reality, that ditch was way too wide to jump over. Even Evel would have known that. Still with great bravado my mom boldly raced her bike (along with daughter, cupcakes, juice, etc.) down the ditch, somehow hoping to have enough momentum to plow it back up on the other side. She lost control and crashed before she got to the bottom. The rest is true; food, drinks, daughter, and pride crashed all around her. It IS an epic family story. 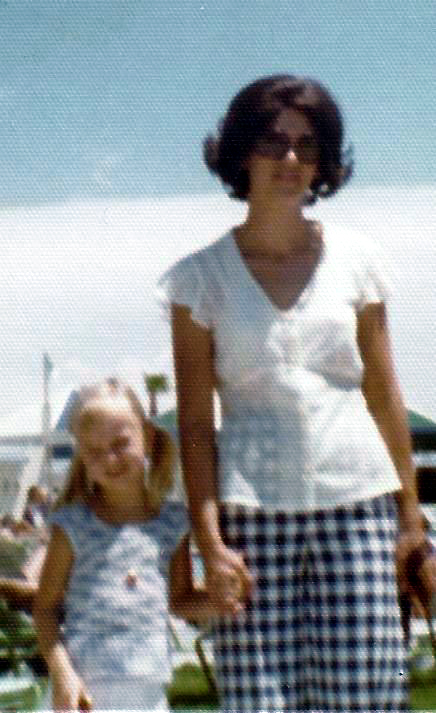 And to us, especially my sister, my mom was still a hero for having tried such a daring feat. That’s our mother: Fearless, selfless, and ready to make us laugh.